Tigers in the Ardennes is an historical reference covering the actions of a German Tiger tank unit in World War II’s Battle of the Bulge. It provides the most detailed look at the actions of a single German battalion in the Battle of the Bulge and is the product of years of research in archives, conversations with German and American veterans, and detailed examination of terrain in the Ardennes battlefields. 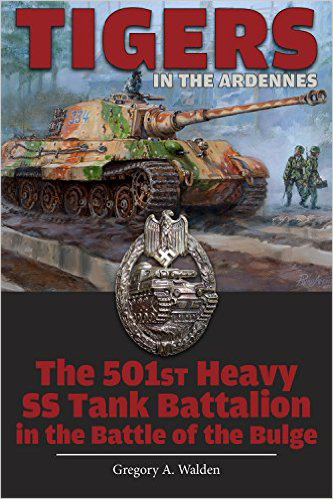 The book includes descriptions of the tanks used in the battle, interviews with German and American veterans, and over 100 photographs, some never before published. Tigers in the Ardennes is available online from Schiffer Publishing (www.schifferbooks.com) and from retailers including Amazon.com, Barnesandnoble.com, and Walmart.com. Meet Gregory Walden at the Meet the Authors Book Fair in the Eau Gallie Civic Center in Melbourne, Florida, on November 21 and 22, 2015, from 9:30AM to 4:30PM. The book fair is in conjunction with the ArtWorks Eau Gallie Fine Arts Festival. Both events are on Highland Avenue in Melbourne, Florida, and are free and open to the public.